this morning my roommate came back to the house. i was in the bathroom. with the bathroom door unlocked, i was waiting for the awkward moment when he'd accidently walk in thinking i wasn't home. fortunately he had the foresight to knock on the door. "hey," i said in a forceful voice, alerting him to the state of occupancy. "oh," he embarassingly replied on the other side of the door, then i heard him go into his bedroom. when i finally got out of the bathroom, i went to get dressed, and i heard the bathroom door closing, my roommate fumbling with the lock. i left for work having not even set eyes on him, communicating through monosyllables only. despite that strange start in the morning, the day went by rather effortlessly and fast. time flies when you're having fun or when there's a deadline. since no deadlines were looming, i must've been having plenty of the former. today i had both the jellyfish game and the weather game ready for testing, transitioning into another project, the postcard game. i don't even remember how many projects i've worked on within the almost 6 months i've been at squid. has it really been that long? time flies! staying busy means job security, and there's been no hint of burn out, i tackle each new project with a lot of excitement, no matter what's the assignment. all this might change come summertime though, when the weather outside is nice and all day long i dream about having fun. i didn't go out for lunch, just finished the rest of my pan fried noodles leftover. a day old and reheated in the microwave, it tasted pretty bad and i threw away the final bites, i couldn't eat anymore. it was just a soggy mess, none of its original crispiness. 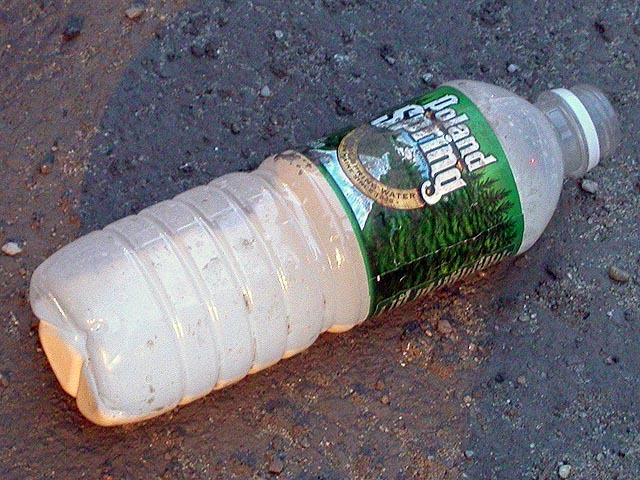 leaving work, i got a photo of the street milk littering the road from the office to south station. alex kates was raving about it last night when we left work together. i thought he was making it up when he told me about these "street milk" in bottled water containers scattered throughout the street, but then i saw it for myself. we tried to guess what it was. there was too much of it to be any kind of body fluid. could it have been paint? or some sort of cleaning solvent? why would you store it in water bottles? maybe it really is milk? he also said this wasn't the first time he's seen street milk, that there'd been occasions in the past where street milk was seen on the streets. i told him the only way to know was to take a bottle and smell it, but the idea seemed to repulse him. 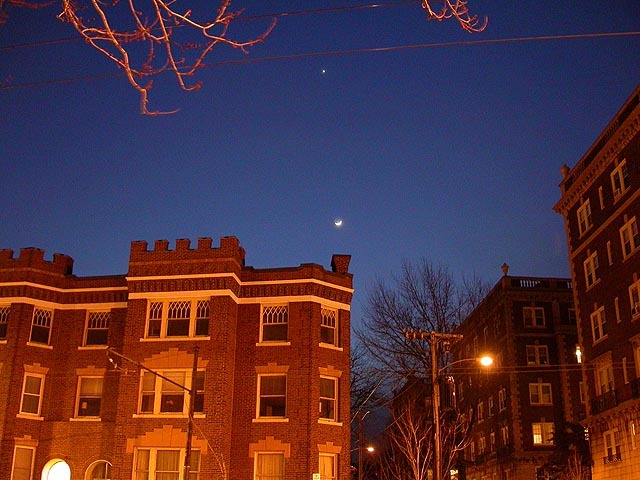 walking home from porter square, i noticed the approaching conjunction between the crescent moon and venus. by tomorrow they will be right next to each other. if the weather's nice and you want to see something cool, look to the sky tomorrow night right after sunset. i heard this moon-venus conjunction will be closer than the one we had last month. about a block away from my house, i heard a noise and felt vibrations in my pants. it was julie calling on my cellphone, wanted to ask if i wanted to get dinner at the paradise lounge in boston, where she was meeting her boyfriend sajid and another friend of his, here in town to see a concert (which she had no interests in seeing, and we'd leave after grabbing dinner with them). i said sure, 30 minutes later julie came by to pick me up and we drove down to commonwealth avenue. there was zero parking to be found as we drove around. we did a u-turn on the green line train tracks, reminescent of a similar maneuever last year on this same stretch of commonwealth avenue, for which julie got pulled over by a police. and wouldn't you know it, two squad cars were waiting for us on the other side of the road as we made the u-turn. we ducked into a side street to loose the fuzz, but they never came after us. we finally found parking on a residential street, then parked to the paradise lounge. sajid and his friend jesse were already waiting inside. 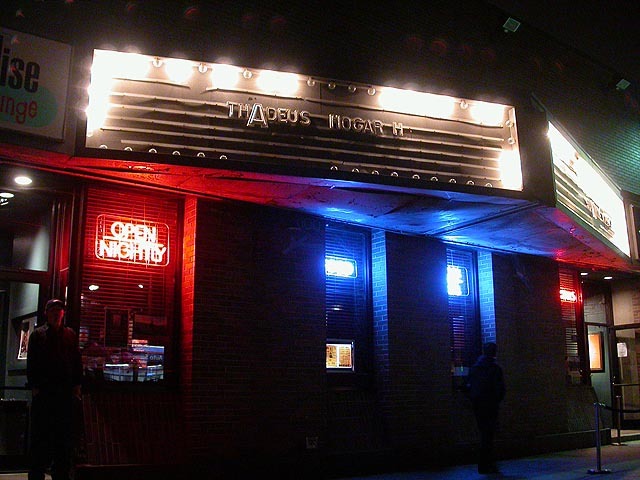 julie and i each had to pay a $5 cover charge because we got there after 8pm. 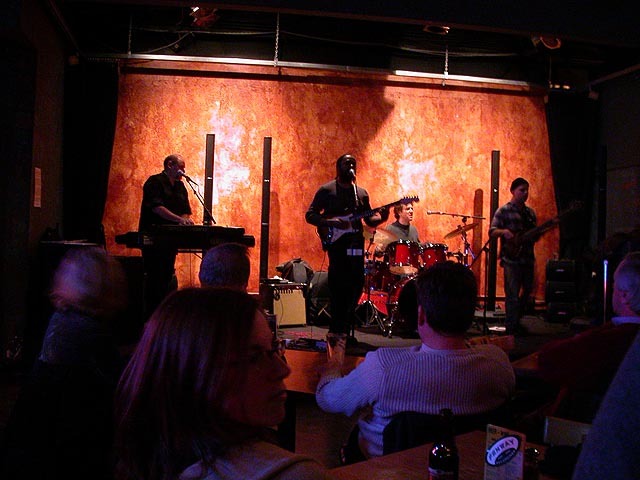 a live band was playing. the music wasn't so bad (a local band playing some r&b funk with a bit of wokka wokka 70's flair) but it was painfully loud (i'm already concerned about my slowly increasing deafness), we couldn't even hear each other talking. food was ordered. i had their $7 beef stew. when it arrived i was surprised to see how small a portion it was, but it was very hearty, i don't think i could've ate anymore. after we paid the check, sajid and jesse ducked into the other side of the lounge for the concert while julie and i took off. i almost got killed crossing commonwealth avenue. i was walking across the street when i noticed this car wasn't going to stop, that it was going to run a red light. i heard a girl screaming, "that car isn't going to stop!" as it the sped by me. standing in the middle of the street, i turned to look at it in disbelief. as if to validate my own right of way, i turned to look at the traffic light -- which was green! i had unknowingly walked into oncoming traffic. i quickly ran to the island in the middle of the road. then walking back to julie's car, we saw a man stumble out of a chinese restaurant and immediately began to vomit right outside their door, spouting a stream of spew onto the sidewalk. we made a mental note of the restaurant, agreeing never to eat there. we came back to my place, just in time to watch queer eye while eating flan. tonight's episode featured an asian guy for the first time (although "massey" doesn't sound like a korean last name). he had a little yapping dog, which i didn't think was very masculine, and he was the most intense hetero i've ever seen on the show, stressed over everything. i didn't care much for his newly decorated home (the improvement wasn't that dramatic), but i was in love with the flat screen plasma television, as well as he was. i thought it was funny when kyan gave him shaving tips, this man was asian hairless. his girlfriend, whom the show kept hidden until the very end, was quite attractive, but totally high maintenance and it was obvious that that relationship wasn't going to last very long. julie left close to midnight after filling me in on some roommate gossip. if i thought having just one roommate was difficult, imagine having three girl roommates! well, actually, that's more like a dream, like three's company plus. i brought out the trash and called it an evening. in the darkness i saw my neighbor jeff walking his dog by the side of his house. he didn't seem happy, and i when i waved to him to say hi, he either didn't see me or ignored me.